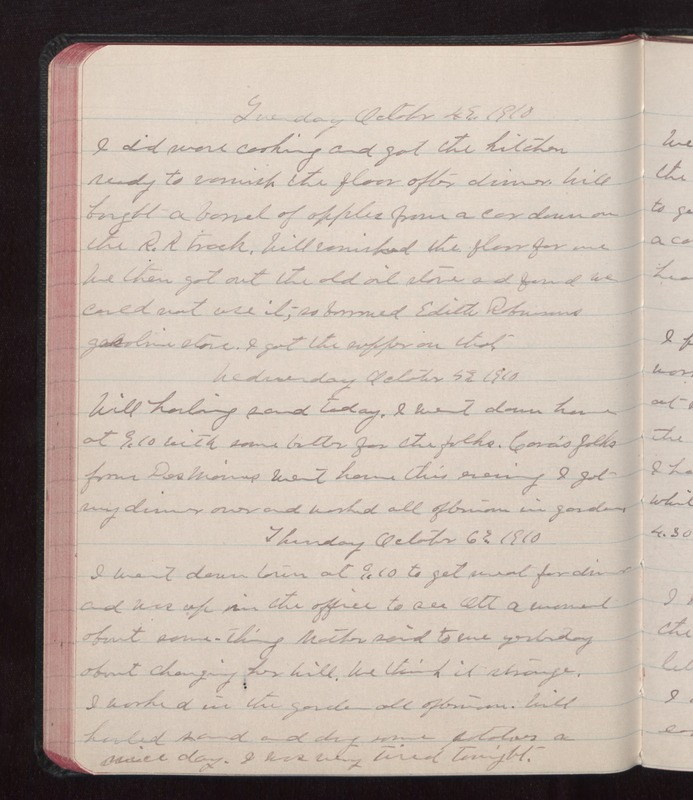 Tuesday October 4 1910 I did more cooking and got the kitchen ready to varnish the floor after dinner. Will bought a barrel of apples from a car down on the RR track. Will varnished the floor for me We then got out the old oil stove and found we could not use it, so borrowed Edith Robinsons gasoline stove. I got the supper on that. Wednesday October 5 1910 Will hauling sand today. I went down home at 9.10 with some butter for the folks. Cora's folks from Des Moines went home this evening I got my dinner over and worked all afternoon in the garden. Thursday October 6 1910 I went down town at 9.10 to get meat for dinner and was up in the office to see Ott a moment about some-thing Mother said to me yesterday about changing her will. We think it strange. I worked in the garden all afternoon. Will hauled sand and dug some potatoes a nice day. I was very tired tonight.